Teeth aren’t used just for chewing food or smiling. 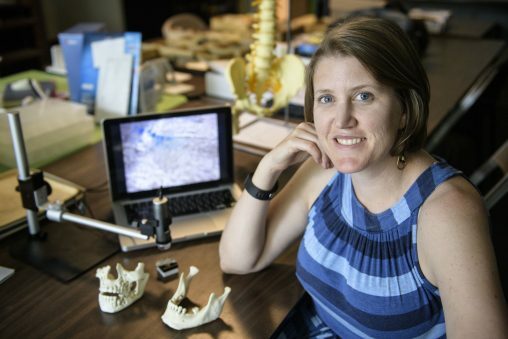 For Wright State anthropologist Amelia “Amy” Hubbard, teeth tell stories about the lifestyle, family and cultural influences of earlier generations. The child of two scientists, she grew up in the U.S. Virgin Islands, fascinated with the natural world, but never thinking that teeth would be her life’s work. The cultural history of the Caribbean is still visible on St. Croix, the small island where Hubbard was raised. From old sugar mills and Danish colonial buildings to prehistoric shell middens, reminders of the island’s history remain throughout St. Croix. Recently, Hubbard discovered a story she wrote in the fifth grade describing her interests in being an archaeologist. As she grew older she read books about Egyptian archaeology and even tried to learn how to read hieroglyphs. With archaeology in mind, she attended Beloit College. She was willing to give her major another chance, taking a class in cultural anthropology that ended with her research being presented at a national conference. With a renewed passion for the subject, she enrolled in other anthropology courses, eventually studying abroad in Tanzania and later traveling to Kenya after graduation as part of a research team from The Field Museum in Chicago. Today, Hubbard describes herself as a specialist in bioarchaeology (the study of past life ways) as a dental anthropologist (through teeth). But her interest in these fields didn’t develop until she read a book written by a professor at The Ohio State University, where she later received her master’s and doctorate degrees in anthropology. 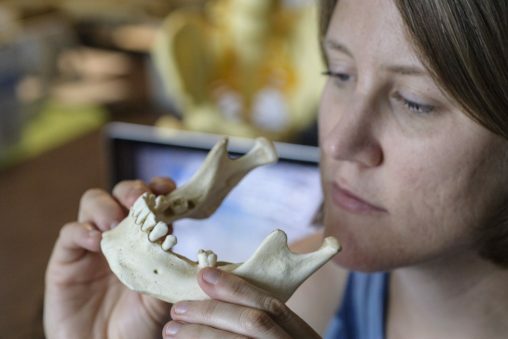 Hubbard credits her love of teeth to her graduate adviser and dental anthropologist, Debbie Guatelli-Steinberg. Hubbard’s current research looks at what ancient DNA and tooth features can tell about the movements and interactions between past peoples. Much of this research challenges old ways of approaching such studies, which she notes doesn’t always make her popular. Amelia Hubbard’s current research looks at what ancient DNA and tooth features can tell about the movements and interactions between past peoples. Some of her work with DNA from living descendants of the skeletal populations she studies also found that mitochondrial DNA, a type of DNA that passed through female lineages and often used in ancient DNA analyses, provides less information than teeth about their histories. Though Hubbard’s work is focused on past peoples, she enjoys working with living descendant communities. In medieval Poland, the period in which the teeth were dated, suspected vampires were buried with rocks to weigh their bodies down, sickles at their necks or coins in their mouths. Though Hubbard has not yet been able to complete an analysis of the baby teeth, she is working on a related project from a nearby cemetery with anthropology major Joshua Keeton. The scientific community at Wright State has been a positive community for Hubbard.